Hai, I'm writing these Blogs to share some interesting /Informative things which i have come across in my life and hope this would be helpful to you also. I own a Nokia Lumia 610 for the past 6 month but not a great fan of it as there is no user friendly or interesting features with it . Another reason is that we don't have an option for internet connectivity for desktop /laptop via phone through cable , unlike other mobiles device. But recently I came ot know about an interesting option called tethering . I also want you to know and make use of this option in your mobile . Very useful feature for internet connectivity. To enjoy this go to the setting --internet sharing --On . Then you will get the broadcast name and the password displayed on your mobile . This means that , from this moment your mobile is a wifi router with the displayed broadcast name(connection name ) and password . Get connected using your laptop or wifi device and enjoy the internet connectivity through your mobile . This feature is available in Nokia Lumia now - Hope this feature will be available in the other mobiles also . 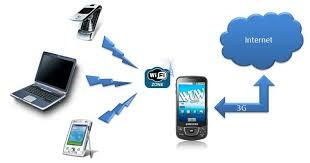 Check you mobile specification , whether it has the tethering option or internet sharing option with it . The same option is available in Blackberry in the option called "Hotspot"